gfoster (Geoff Foster, sports editor): We have 52 games in the books of the men’s NCAA Tournament. And there has been one prevailing theme: chalk. There has been a staggeringly small amount of bracket busting. Other than Oregon (a No. 12 seed but a Power Five conference winner), the highest seed remaining is Auburn at No. 5! In the round of 32, the favorite won 100 percent of the games! If you picked all favorites in your bracket (like my mom probably did), you’d be 87.5 percent right. I could go on and on. So, do you think this is just an aberration, or is there something behind the dearth of Cinderellas? jplanos (Josh Planos, contributor): FiveThirtyEight’s model was pretty chalky when the draw was announced. It certainly could be a matter of more appropriate seeding or merely an opportunity for the committee to pat itself on the back before next year goes haywire. jakelourim (Jake Lourim, contributor): I was surprised like everyone else by that trend. Even given the slim chances to reach the Sweet 16 given to those double-digit seeds, we would expect at least one Cinderella to make it, right? sara.ziegler (Sara Ziegler, assistant sports editor): It does seem like the committee did a pretty good job of seeding this year, as our colleague Neil Paine wrote. The seeds followed what the stats would have recommended — and the top teams do seem to be better than in years past. gfoster: So there hasn’t been a shocking upset, with all due respect to Mississippi State, but some teams have had an easier time with their first two opponents than others. Which team has impressed you the most in the early going? jplanos: I think Gonzaga has looked pretty tough with two double-digit victories. The 38-point opening-round victory over Fairleigh Dickinson was the most lopsided tournament game in two years. Baylor and Fairleigh Dickinson aren’t strong defensive teams, to be sure, but the Zags have decimated both. In each win, Gonzaga posted at least 19 assists, was at least plus-10 on the glass and shot 35 percent or better from three and 53 percent or better from the field. According to Ken Pomeroy, two of the team’s three best performances this season in offensive rebounding percentage have come in the tournament. Brandon Clarke somehow got glossed over for every major award and has gone berserk. Against Baylor, he joined Shaquille O’Neal as the only players in NCAA Tournament history to put up 36 points and five blocked shots in a single game. sara.ziegler: Kentucky had a tricky draw against a very talented Wofford team, but they looked pretty good. Michigan has looked good, too. And Purdue has been under the radar — my radar, at least — but the Boilermakers have posted two convincing wins. It’s funny — even though the bracket has been so chalky, several of the top seeds have looked suspect at times. jakelourim: I think from a performance standpoint, I’d have to say Texas Tech. I thought Buffalo played great on Friday and would give the Red Raiders some trouble on Sunday, but Chris Beard’s team hammered Buffalo and got back to No. 1 in the country in adjusted defensive efficiency. That clash with Michigan on Thursday is going to be a slugfest. gfoster: I’ve also been impressed by the Texas Tech defense. Northern Kentucky’s Drew McDonald was the conference player of the year, and he was completely erased from the game in the first round, scoring only 5 points. Likewise, the Red Raiders more or less shut down Buffalo’s best player in CJ Massinburg, who couldn’t get much going. It will be interesting to see how they do against Michigan, which isn’t dependent on a top-heavy scoring guard like those two are. jakelourim: It might just be my impression, but I think after UMBC knocked off Virginia last March and Virginia remained such a prominent storyline all season, both the No. 1 and No. 16 seeds were on guard Friday — the 1s to avoid being embarrassed, the 16s because maybe UMBC brought new hope. Duke, North Carolina and Virginia together were -2.3 in scoring margin in their first halves. Then they all recovered and won by double digits. jplanos: Pretty typical for teams of all strengths to start opening-round games tight, too. gfoster: OK, so which high seed has looked the most vulnerable? It’s hard to knock a team for winning two games, but let’s do it anyway. sara.ziegler: I still think Virginia could find itself in trouble because of its slow play. The Cavs looked much better against Oklahoma on Sunday, but still. jakelourim: I’d be worried about Tennessee. That was a near-disaster Sunday against Iowa, giving up a 25-point lead to go to overtime before pulling it out. That’s not a great Iowa team, either, and Tennessee’s next opponent (Purdue) won’t be as forgiving. sara.ziegler: Jake, I think Tennessee should be worried, too. Though how much of that game was the Volunteers getting up so much, then taking their foot off the gas? jplanos: And what was up with Admiral Schofield requesting not to play in OT? jakelourim: Very weird, Josh, regarding Schofield. All around, it was a very weird way to end a game in which the Vols led by 21 at halftime. I do think a lot of that was just diminished intensity in the second half, but even that was a concern. Purdue, by contrast, was up by 19 at halftime and then built that lead to as many as 35 before winning by 26.
gfoster: I also agree that Tennessee’s days are numbered. The Vols’ offense is supposed to be the third-most efficient in the country, but that isn’t what we’ve seen so far. Colgate’s defense is objectively bad, one of the worst in the tournament. Only scoring 77 points there is kinda a letdown, even though it’s a respectable number. And Iowa’s defense is far from stellar, too. jplanos: I never thought UCF could compete with Duke — and the Knights came about as close to an upset victory as possible. Granted, it was in Orlando. But Duke’s inability to adjust at halftime seemed problematic. Plus, it wasn’t like the Blue Devils had an off shooting night. Going 10-for-25 from 3-point range is a really good performance for Duke, and it resulted in a 1-point win. sara.ziegler: Agree. And it wasn’t just Tacko Fall who was a problem for Duke! jplanos: No doubt, Sara. I have a hard time believing Duke snags that last-second rebound for the put-back bucket with him in the game. To say nothing of the multiple fouls on that play. jakelourim: Absolutely, Tacko fouling out was a game-changer. Even if the rebound does still bounce to Duke, he probably blocks any put-back attempt if he’s there. It’s crazy to me that UCF was up by 3 with what ended up being one possession left and lost in regulation. That’s almost impossible! jplanos: Most games are filled with tens of what-ifs, but it almost makes it worse for UCF that Aubrey Dawkins, who played a masterful game, missed the alley-oop late that probably would’ve put it away (and then the tip in the waning seconds). 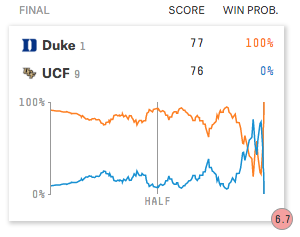 sara.ziegler: That sequence was a 5-point swing in Duke’s favor. gfoster: All this said about Duke, I haven’t been that impressed by Virginia Tech. Both of the Hokies’ wins were ugly affairs against lesser teams. The Saint Louis game was an absolutely brutal free-throw contest. So I don’t think Duke is going anywhere just yet. Do you disagree? If not, what other high seed could be on upset watch? jakelourim: I definitely thought entering the tournament that Virginia Tech had a great (and underrated) chance to upset Duke in the Sweet 16. The Hokies beat Duke in Blacksburg last month, and while Zion didn’t play in that game, neither did Virginia Tech star Justin Robinson. But now, after watching the first weekend, I do doubt Virginia Tech’s chances against Duke. It just doesn’t seem like Robinson has eased back into the lineup as seamlessly as Tech had hoped. gfoster: He seems like he’s playing hurt, to be honest. jplanos: I agree with you, Geoff. I’m not high on the Hokies. 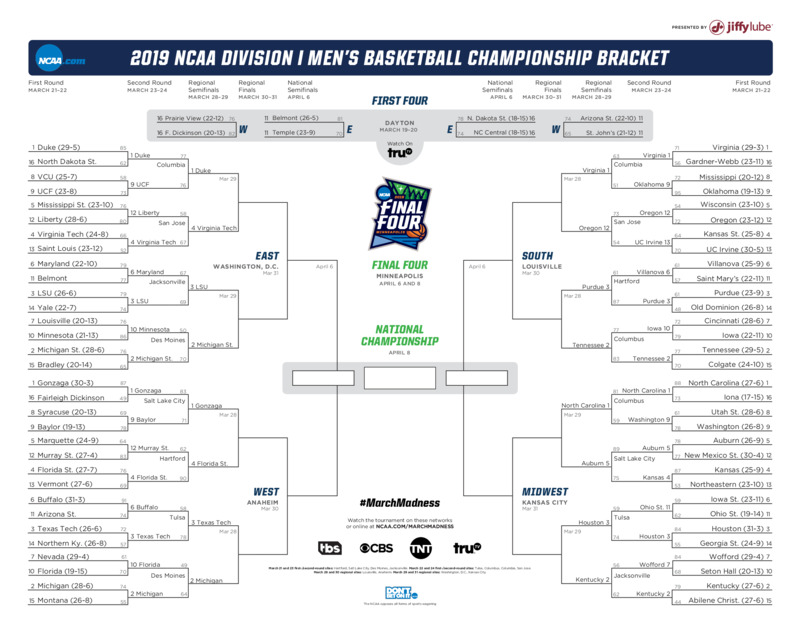 I mostly expect chalk to play out in the Sweet 16.
jakelourim: The flip side of the first weekend lacking upsets is that it set up some awesome matchups for the Sweet 16, including four No. 2-vs.-3 seed matchups (three of them between top-12 teams in KenPom). sara.ziegler: The West region could be fun — Florida State has a real shot against Gonzaga, and I like Texas Tech over Michigan. jplanos: I think the best thing that could happen for Texas Tech is for Jordan Poole to drill two threes to open the game. For my money, there isn’t a more inconsistent Overconfident Guy left in the field. gfoster: I think Oregon has a legitimate shot against Virginia. The Ducks are by far the lowest KenPom team, and it’s not close. But that doesn’t speak directly to how well they are playing right now. Point guard Payton Pritchard is a man on fire. sara.ziegler: I refuse to believe in Oregon. jplanos: I refuse to believe in the Pac-12. gfoster: Both that game and the Michigan game will be complete rock fights: 60 to 65 points will be enough to win either. jakelourim: While this belief burned me in the bracket’s first weekend, I just think the Pac-12 has nothing to show for itself this weekend. How did Oregon lose so many games out of that league? The Ducks also skated by against a lesser second-round opponent — seemed like the mighty Anteaters used up all their juice in upsetting K-State on Friday. sara.ziegler: The Ducks have the 74th adjusted offense in the country, according to KenPom. That’s not how you beat Virginia. gfoster: Gardner-Webb was beating Virginia for a half. I just feel like the Cavs tighten up when they are playing from behind. Oregon is the opposite — they have been playing with nothing to lose for weeks. sara.ziegler: I agree, Geoff — I just don’t think Oregon is good enough offensively to get a lead. jakelourim: I really like Virginia’s path because the Hoos play a No. 12 seed first and are 26-0 against teams outside the KenPom top 15 this season. An underrated part about that region: Virginia will play in Louisville’s home arena, which is as familiar to the Cavs as you could hope to be at this stage in the tournament. The Hoos have played and won in that building in each of the past four seasons, including an inconceivable comeback last season from down 5 with less than 7 seconds left. gfoster: So Josh, you wrote about Murray State. Jake, you wrote about Wofford. It’s really sad that the mid-majors are all but gone (depending on how you define Gonzaga and Houston). Which one were you most disappointed to see exit the tournament? jplanos: Wofford, but only because Murray State would’ve gotten waxed by Gonzaga in the Sweet 16 had the Racers advanced. With Wofford’s perimeter shooting, they might have had a puncher’s chance against Houston. Loved the offensive flow of their game(s). jakelourim: I’d say Wofford, too, because of how the Terriers lost to Kentucky on Saturday. Watching the tiny SoCon upstart hang with Kentucky, only to watch Fletcher Magee clank shot after shot off the rim, was painful. You have to feel for Magee, who is now the most prolific 3-point shooter in NCAA history but just went cold at the worst time. jplanos: I know the myth of the hot hand will be argued for eternity, but at what point do you tell a guy to stop shooting? Especially when the guy’s offensive output seems to almost exclusively consist of inefficient jump-turn-and-figure-it-out jumpers. gfoster: The truth is, he had to keep shooting. He’s a huge cog in their scheme, and they don’t have enough talent to just let the other four to six guys pick up the slack. People were comparing him to Steph Curry at Davidson! So I, like everyone else, was shocked that NONE of those dropped, even the crazy off-balanced shot attempts. sara.ziegler: Live by the three, etc. But Magee did set the 3-point record again Seton Hall, which was cool to see. gfoster: I actually think Belmont could have made some noise if the Bruins could have gotten past Maryland. (They lost at the wire.) They are an electric, up-tempo team, and I think they would have beaten LSU and then been a fun test for Sparty. And they would have extended the First Four streak! sara.ziegler: Would have loved to see more from the Bruins. jplanos: That was a tough matchup for Belmont. Maryland coughs it up constantly, but Belmont doesn’t force turnovers. When you’re already operating at a talent deficit, and you can’t even depend on additional chances, it’s almost impossible to overcome unless you shoot the lights out. That game was Maryland’s season-best performance in terms of turnover percentage, according to KenPom. jakelourim: That’s why I think this chalk-heavy first weekend was a one-year deal — just a collection of momentum swings that went toward the favorites. If that backdoor pass from Belmont goes through, Aubrey Dawkins’ tip rims in and Magee makes even, what, two of 12 3-pointers, this is a totally different tournament. gfoster: So, which conference has impressed the most? I know who it is not: The Big East. Pretty sad effort from the conference that has won two of three titles (granted, that’s just Villanova, so a generous way to praise the conference). jplanos: Agreed, Geoff. When your second best team gets dusted by nearly 20 by a team from the Ohio Valley Conference … yikes. sara.ziegler: The Big 12 has been pretty pathetic. Texas Tech has the whole conference on its shoulders now. jplanos: The SEC has been the most impressive. But how about the Big Ten getting three teams into the Sweet 16? 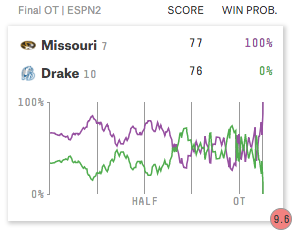 Maryland and Iowa were about as close as you can get to advancing, too. gfoster: Is there any team that has completely defied what you thought of them entering the tournament? jplanos: Purdue. Mark me down as having never believed in the Boilermakers all season. All too often it seems to be Carsen Edwards or bust, with the latter winning out. Purdue lost two of its last three games entering the tournament, including an opening-round loss to Minnesota in the Big Ten tournament. But after two double-digit victories, including an 87-61 thrashing of defending champion Villanova, well, I’m still not ready to believe in their chances moving forward. But I am ready to eat crow. I wasn’t all that surprised that the Wildcats were eliminated before the Sweet 16, but I am surprised that the Boilermakers reduced them to rubble and are still standing. gfoster: Mid-majors or non-mid-majors, which team has let you down the most? jplanos: In my opinion, the biggest disappointment is Nevada, by a considerable margin. Most of this roster reached the Sweet 16 a year ago, and the Wolfpack ostensibly were primed for another deep run in the tournament. Instead, Nevada failed to win its conference tournament and then got bounced in the opening-round of the NCAA Tournament by a fairly average Florida team. They allowed the Gators to dictate the pace and played at the slowest tempo of any game this season, according to KenPom. Not only that, they posted the second lowest effective field goal percentage of any game this season and the highest turnover rate of any game this season. I even talked myself into Jordan Caroline smashing a fire extinguisher as a galvanizing moment for the team! Turned out it was just a representation of their frustrating season. jakelourim: Even given everything that happened this season, can I still say Kansas? I know, I know — the Jayhawks played the season under the cloud of player eligibility issues, lost Udoka Azubuike early, ended The Streak and generally looked very un-Kansas-like. But this was still supposed to be a really talented team. Watching them not just lose but get run off the court by a football school in the second round was very odd to me. sara.ziegler: I think that loss is what they deserve for being placed in the Kansas City regional. jakelourim: And also, Cincinnati was sent to Columbus and collapsed against Iowa in the first round. That’s like when you draw a bad foul call and go to the line and miss the free throws. gfoster: Mine is Buffalo. I had the Bulls in the Sweet 16 in all the brackets I filled out. And felt vindicated when they absolutely steam rolled their former coach Bobby Hurley. But Texas Tech absolutely closed down shop from the tip-off on. They didn’t even make a run. jakelourim: Nevada is another good (bad?) one, Josh. I would have been very worried for Michigan if Nevada were on the other side in the second round. That’s no seventh-seeded roster. But Eric Musselman’s team never put it together like it did in last year’s tournament. gfoster: That’s another thing about this tournament: There really hasn’t been much drama, Duke and LSU aside. Of the 16 winners in the round of 32, only three didn’t cover the spread: Tennessee, Duke and Gonzaga (and they won by 12 points). sara.ziegler: My disappointment is actually that Oregon made it this far. I hate it when major-conference schools that played like crap for most of the season make it to the Sweet 16. Seems unjust. gfoster: Would you like them better if they had Bol Bol? sara.ziegler: Yes, of course. They’d also be way better. jplanos: I think if Auburn had dropped that opening-round game, we’d be talking about this tournament wayyyyyyyyy differently. That would’ve given us two all-timers in the opening weekend. sara.ziegler: Oh, yeah — I forgot how close that game was! jakelourim: New Mexico State could have gone on and handled Kansas, too, no? jplanos: Yeah, my analysis is that Kansas is bad. gfoster: Before we get to our updated Final Four picks, let’s talk about the women’s tourney, which has been objectively better from an entertainment standpoint. What is your biggest takeaway so far? sara.ziegler: There were three overtime games in the first round alone! jakelourim: Absolutely, the women’s tournament has been more entertaining, I think. gfoster: According to our model, this is still a two-team tournament. Baylor and Notre Dame combine for a 60 percent chance of winning (32 percent and 28 percent, respectively). Although Louisville and UConn appear to be mutually hurting each other’s chances by just being in the same region. sara.ziegler: Though most of the top women’s teams have all advanced, we’ve seen closer games than we have in the past. No. 2 Iowa had all it could handle from Mercer. And No. 10 Buffalo acquitted itself nicely against UConn. jakelourim: Yes, Buffalo played well, and didn’t even have to kidnap any players! sara.ziegler: OMG, Jake. That’s amazing. 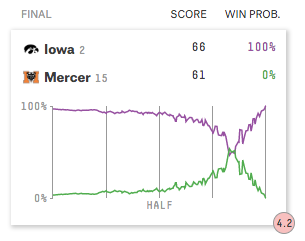 jakelourim: Mercer took Iowa to the wire in an effort to produce what I believe would have been the first 15-2 upset in the history of the tournament. Look at that excitement index! jakelourim: That is a crazy game. Let’s go lightning round through the regions, starting with the East. I had Michigan State, I’m staying with Michigan State. jakelourim: Had Duke, staying with Duke. MSU doesn’t have the dudes to take them down. sara.ziegler: Yeah, I’m sticking with Duke. There’s just so much talent there. jplanos: I had all No. 1 seeds because I’m not fun at parties. So I’m sticking with Duke. gfoster: OK, West. I had Gonzaga in my bracket, I said Michigan on our podcast. I’m going with…..
jakelourim: Had Michigan, staying with Michigan. Happy to die on this hill. jplanos: Allow me to re-plug Hot Takedown and say that I’m finally ready to go with my heart. The Wolverines have been tenacious throughout the tournament, as best showcased by a Michigan tuba player running down the Gators mascot. gfoster: Only because I think they are showing again that they are the best-coached team in the country. They don’t do any of the things that cost teams games: turn it over, foul trouble, bad shots, etc. jakelourim: Yes, I think they have the best coach in that region. That’ll be enough. gfoster: OK, in the South. I had UVA. I might have said Nova on Hot Takedown, but that was clearly me being an idiot. jplanos: You did indeed say that, Geoff. I will withhold my opinion on that pick. gfoster: That was a product of me not liking ANY team in the region. And I still don’t!!!!!! sara.ziegler: Wait … that was the region I didn’t like, Geoff. You didn’t like the Midwest. gfoster: I like that more, now. I have an answer there. I still don’t like anyone in the South. I have Tennessee … which I don’t feel great about. jplanos: I’m still going with UVA. Whoever reaches the 20-point mark first is deemed the winner. jakelourim: Had Virginia, staying with Virginia. Still think Tony Bennett’s team is the most consistent in the country — NCAA Tournament demons notwithstanding. gfoster: OK, let’s do the Midwest. jplanos: Tar Heels. Never a doubt. sara.ziegler: Remember when they were trailing to Iona at halftime of that game? That was fun. jplanos: I said never a doubt, Sara! jakelourim: I’ve got Ol’ Roy and UNC. sara.ziegler: You guys are BORING. jakelourim: This tournament started it! gfoster: Only because I need to pick something that can be mocked later, I’m taking Auburn. 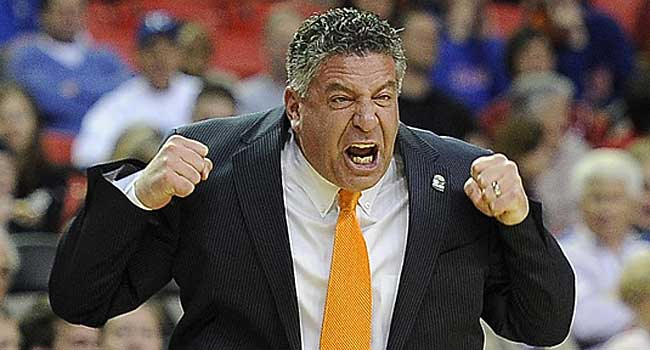 Bruce Pearl’s team is here to provide the madness of 2019. The Tiger offense is so impressive. I love these teams (like some Beilein teams) where every guy on the court can knock down the three. jplanos: HAHA, Geoff. Come on now. gfoster: You think there will be no surprises at all? We’ll see.